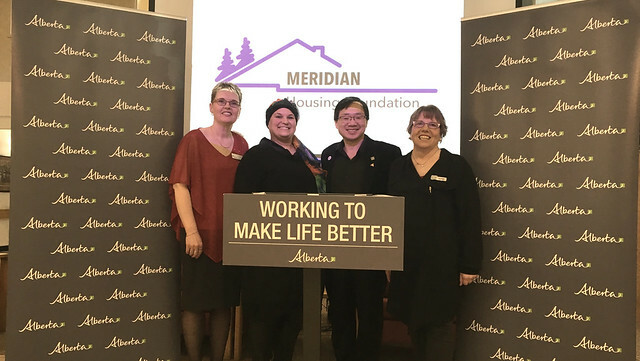 (L to R) Lori-Anne St. Arnault, Stony Plain MLA Erin Babcock, Mayor William Choy and Meridian Housing Foundation vice chair Judy Bennett at Whispering Waters Manor in Stony Plain. The $14-million affordable housing project includes 63 one- and two-bedroom units to meet the needs of adults aged 55 or over with low income. The province is contributing $6 million to the project to help address the demand for affordable housing in the Stony Plain area. Meridian Housing Foundation, the local housing provider, will manage the units. Commercial space will also be available in the new four-storey complex to generate additional income, resulting in a sustainable operating model. The affordable apartments are expected to welcome tenants in 2020. Supporting this project is part of government’s commitment to build and restore 4,100 affordable housing units through the Provincial Affordable Housing Strategy.